VMware, a leading innovator in enterprise software, in collaboration with Forbes Insights, has revealed new Asia-Pacific and Japan (APJ) findings from a study on the impact of business apps on employee and business performance. The research highlights that while APJ organizations are actively deploying business apps, their employees feel that more can be done to increase the accessibility of employee technologies in the workplace to enhance company performance and secure future growth. This situation is the result of a disconnect between CIOs and end-users, which must be addressed in a business environment that is experiencing intense competition for skilled talent, geographically dispersed frontline staff and a greater demand for collaboration and job satisfaction. The research, titled “The Impact of The Digital Workforce: The New Equilibrium of the Digitally Transformed Enterprise”, surveyed 2,150 global CIOs and frontline staff in large enterprises on how the use, availability and access to business apps is affecting their work and their companies. Respondents from Australia, China, Japan and India were included in this research. Businesses driven by employee initiative and management trust – by granting employees greater access to the apps they prefer and need to do their jobs – are benefiting from faster decision making, increased productivity, better collaboration and higher staff satisfaction, according to the research. APJ companies are ahead of European companies and on par with North American companies in providing employees with the apps they need and making them readily accessible. 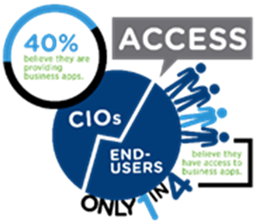 However, while 39 percent of APJ CIOs believe that they are deploying the apps their employees need, only 24 percent of APJ end-users believe they have access to the apps they need. This highlights a significant difference between CIOs rolling out business apps and employees’ ability to actually use these apps. For example, less than one-third of APJ end-users believe that business apps are readily accessible to employees on all devices. Digital transformation, particularly through highly accessible employee-centric apps and productivity suites, is forcing management to adjust to a new equilibrium within the enterprise. Companies leveraging business apps are seeing a strong impact on workforce morale. Apart from helping to improve human resources operations like recruitment, retention and onboarding, APJ employees said that apps are improving their job satisfaction and making their company a better place to work. When looking forward to the role of business apps, four in five respondents believe apps will be either ‘important’ or ‘very important’ in the future. Apps dramatically improving job satisfaction among employees in APJ. Respondents in India and China report the most dramatic improvements, with 42 percent and 26 percent strongly agreeing that apps have improved their work life, followed by Australia at 15 percent. Business apps and productivity solutions are driving a fundamental transformation in the individual employee’s workday, increasing workplace efficiency. Respondents in India reported the highest rate of workplace efficiency improvement (16 percent), followed by China and Japan at 13 percent. APJ end-users indicated that apps lead to significant reductions in the time they spend on manual processes. Emerging markets like India (18 percent) and China (15 percent) saw a significantly higher reduction as compared to developed markets like Australia (13 percent) and Japan (13 percent). In less-developed economies, such as China and India, the adoption of highly-automated, user-friendly business apps is disrupting the old ways of work and enabling employees to leap ahead in productivity and efficiency. Overall, APJ companies that make apps available to employees when and where they need them reported higher performance at the employee- and enterprise-levels. The survey was conducted from June to August of 2017 by Forbes Insights, in collaboration with VMware. The survey targeted 2,150 executives, which were equally divided between CIOs and end-users of business apps. The respondents were drawn from 16 countries, including Australia, China, India and Japan, 12 different industries, and companies with a minimum of US$250 million in revenue. Forbes Insights is the strategic research and thought leadership practice of Forbes Media, a global media, branding and technology company whose combined platforms reach nearly 94 million business decision makers worldwide monthly. By leveraging proprietary databases of senior-level executives in the Forbes community, Forbes Insights conducts research on a range of topics to position brands as thought leaders and drive stakeholder engagement. Research findings are delivered through a variety of digital, print and live executions, and amplified across Forbes’ social and media platforms. VMware software powers the world’s complex digital infrastructure. The company’s compute, cloud, mobility, networking and security offerings provide a dynamic and efficient digital foundation to over 500,000 customers globally, aided by an ecosystem of 75,000 partners. Headquartered in Palo Alto, California, this year VMware celebrates twenty years of breakthrough innovation benefiting business and society. For more information, please visit www.vmware.com/company.html. Subscribe to The Australian Security Magazine today! The ASEAN Technology & Security Magazine is the country’s leading government and corporate security magazine. It is published bi-monthly and is distributed free of charge to many of the biggest decision makers in the security industry. © Copyright 2016 My Security Media Pty Ltd.